Keith Grant, founder of Frontline Equipment Technologies, has been an inventor and tinkerer ever since he can remember. "I was always trying to build a better mouse trap as a kid and it used to make my dad mad," he said. "I was always developing new tools and widgets, and it carried over to today. I'm a retired firefighter who worked on developing new firefighting tools for us to use. Though I retired from fire fighting, I haven't retired from inventing." 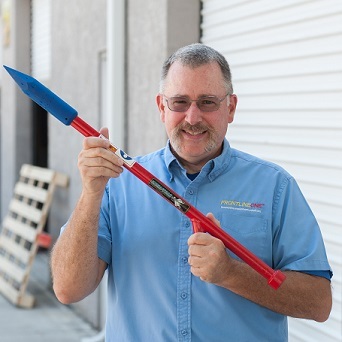 At Frontline, Grant has developed two distinct lines of patent-pending tools, the HydraSpear and GatorFloss. HydraSpear was originally designed for an energy company that needed a tool to inject a firefighting agent to manage thermal events and fires in its coal storage facilities. Since developing the tool, Grant has discovered multiple additional uses, including in the marine industry to jet holes for dock pilings. GatorFloss was originally designed as a tool to extract motorsport drivers from their cars after a crash. Grant improved upon the original design to evolve it into a multi-use tool for anyone who needs to cut in limited access spaces like plumbing, HVAC and other contractors. "We started as a prototyping tech company developing solutions to problems with equipment needs in a variety of industries," Grant explained. "The two lines we've developed are examples of our innovative thinking in problem areas." Grant's advice for aspiring entrepreneurs is fourfold. "First, don't give up," he said. "Second, educate yourself as much as possible about areas you're going into, your competition, what the current technology is and what you're trying to accomplish. Third, be willing to put your money where your mouth is and finally, get help because you can't do it all by yourself."